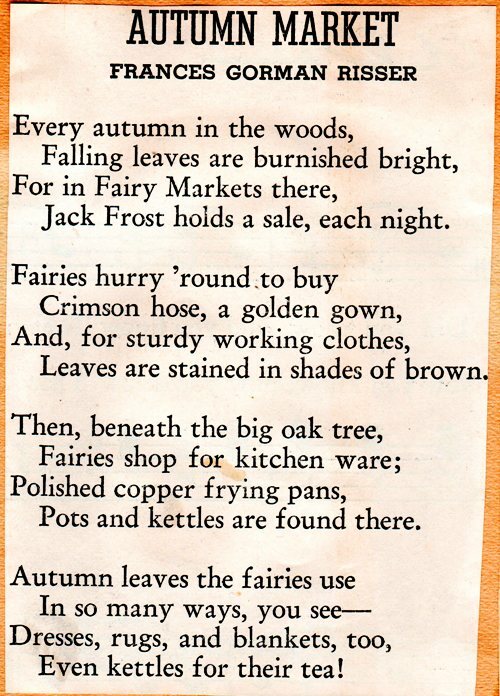 Last September I wrote a post about Autumn Poems after looking through a scrapbook full of poems that my Grandma saved from newspapers and magazines. The poems were from about 50 years ago. 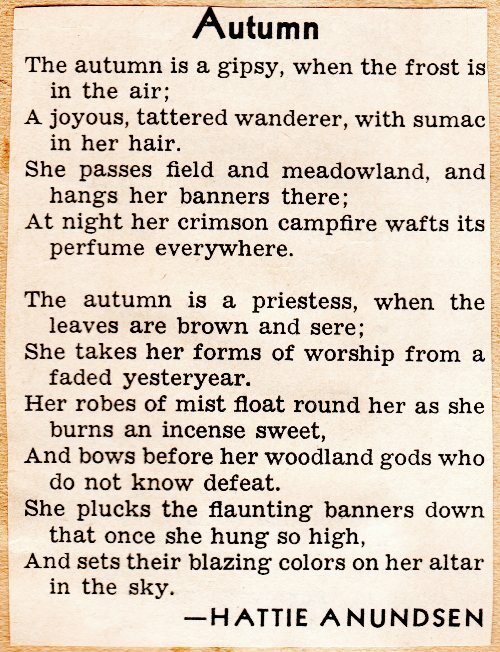 Last week was the start of fall or autumn so I decided to share a few more of the poems from the scrapbook. This first poem does not have the poet listed. Fill the house with cheer. Most likely this poem is longer since it does not end with a period. Perhaps the rest of the poem included the author. I wonder why my grandma did not paste the complete poem into the scrapbook? Of course since I was curious I had to see if I could find the ending of the poem. I found the poem in St. Nicholas magazine. The poem was written by Annie Willis McCullough and here are the final lines. Jack Frost holds a sale, each night. Leaves are stained in shades of brown. Pots and kettles are found there. Even kettles for their tea! A joyous, tattered wanderer, with sumac in her hair. At night her crimson campfire wafts it perfume everywhere. She takes her forms of worship from a faded yesteryear. And bows before her woodland gods who do not know defeat. And sets their blazing colors on her altar in the sky. I hope you enjoyed these three autumn poems. I am really looking forward to a colorful autumn, but the color comes late here in California. 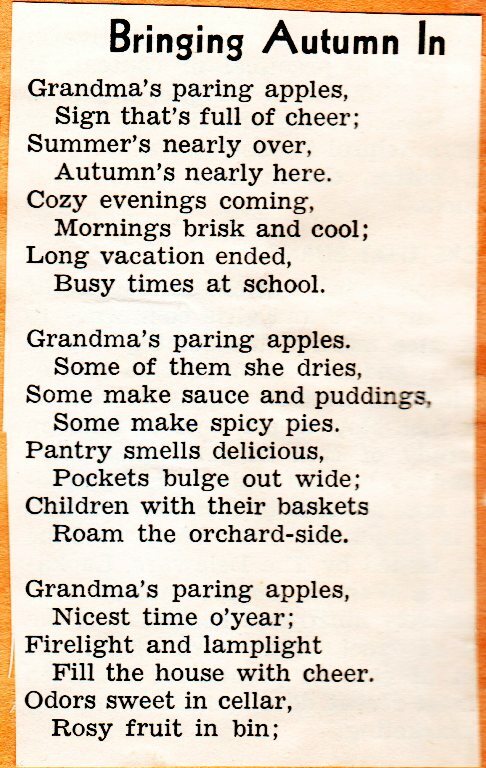 This entry was posted in Culture, Seasons and tagged Annie Willis McCullough, Apples, autumn, Fall, Frances Gorman Risser, Hattie Anundsen, Poems, Poetry, Poets, scrapbook, St. Nicholas. Bookmark the permalink.